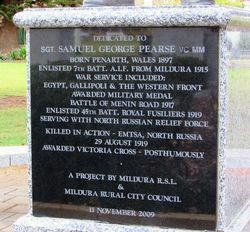 The statue commemorates Samuel George Pearse V.C. 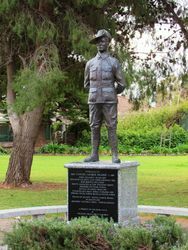 (Victoria Cross) who was born in Wales and emigrated to Mildura with his family. On 29 August 1919 during at attack on an enemy battery position north of Emtsa, Pearse, under heavy enemy fire, cut his way through barbed wire thus clearing a way for troops to enter. Enemy fire from a blockhouse was causing casualties so Pearse charged single-handed, killing the occupants with bombs. He was killed by machine-gun fire several minutes later. For this action he was awarded the Victoria Cross.